Ae Fond Kiss is one of Robert Burns’s most famous love songs, one that outlines not the joy that love can bring but the acute pain of a broken-heart. It is moving, emotional and tender. The song was written in 1791 and sent in a letter to Mrs Agnes McLehose (addressed as ‘Nancy’ in this instance). Burns met Agnes (1758–1841) in Edinburgh when she arranged an introduction to the bard by a mutual friend, Miss Erskine Nimmo. They engaged in an intense yet unconsummated love affair, largely through a series of passionate letters exchanged between the two. Following Burns’s departure from Edinburgh in 1788, the bard’s relationship with Agnes suffered owing to his reunion with and eventual marriage to Jean Armour, not to mention an affair with Jennie Clow, Agnes’s maid, which resulted in a child. In 1792, Agnes returned to the West Indies at the request of her estranged husband (only to return after finding out he had started another family). Upon learning of her planned departure, Burns was inspired and sent her the heart-rending song Ae Fond Kiss. 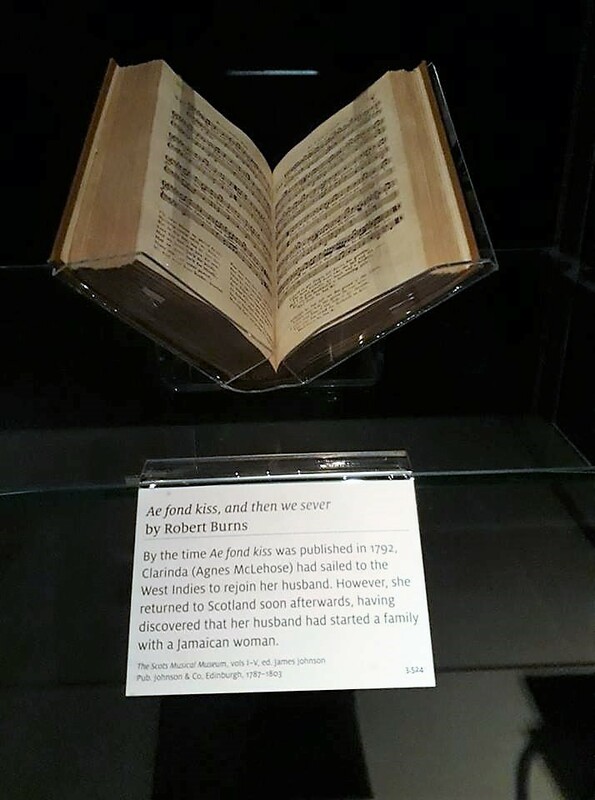 The song was first published in 1792 in James Johnson’s Scots Musical Museum (which can be seen on display at RBBM). In the third verse, the speaker reflects upon his infatuation with Nancy, suggesting that he could not resist her charms. Notice how the emphasis is on her appearance rather than other attractions: “But to see her was to love her”. Nancy may have had a great personality, came from a respectable background but here the speaker is idealizing the external beauty only. This is classic Burns as he himself and some of his works do have undertones of machoism, for example, cheating on his wife and in Tam o’ Shanter with Kate at home ‘nursing her wrath’ whilst Tam is drunk, flirting with Kirkton Jean and eyeing up Nannie! The language is relatively straightforward and is polished compared to some of Burns’s other poems in Scots. Scots pronunciations are used throughout – for example, ‘nae’ for ‘no’ and ‘weel’ for ‘well’. Scots terms are limited to ‘ilka’ for ‘each’ or ‘every’ in the fifth verse. Perhaps Burns’s reasoning for this is because Nancy was included in polite 18th century society in Edinburgh and would have spoken in English rather than Scots? This would make any romantic swoon but one should keep in mind that on a biographical level, Burns writes to Agnes long after their initial infatuation. We know that Burns had returned to his own wife and he had also got Agnes’ servant pregnant. Can we still see this song as a true outpouring of emotion? Or, should we see it as a carefully crafted piece of poetry? 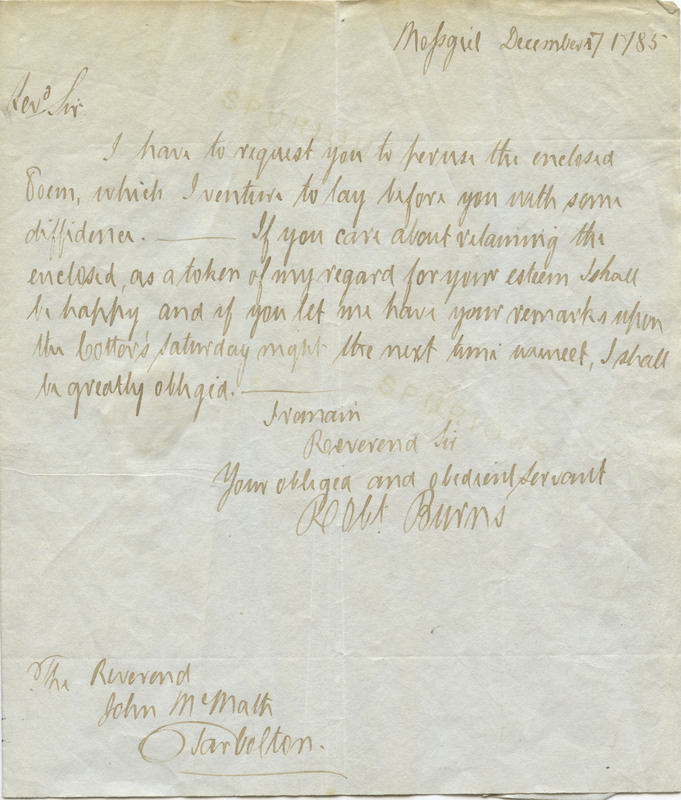 I think it is both – Burns had a tendency to have bursts of illogical emotion when it came to his love affairs, like confessing undying love to one whilst happily married to another, but that does not mean it was not real to him – but I do not think it matters either way you interpret it. It is what it is: and that is a beautiful love song. 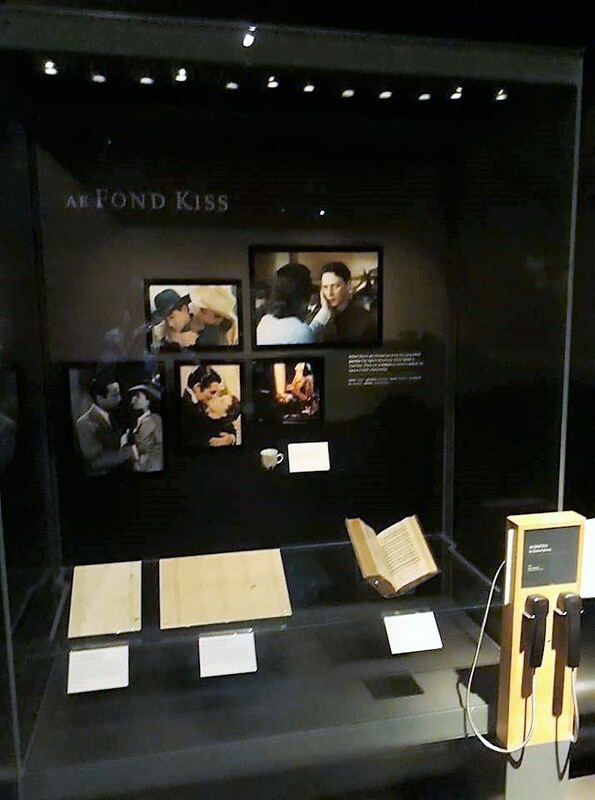 In the main exhibition space within the Robert Burns Birthplace Museum, there is a display case dedicated to Ae Fond Kiss which has four objects on display as well as an interesting contemporary interpretation of the work through images. 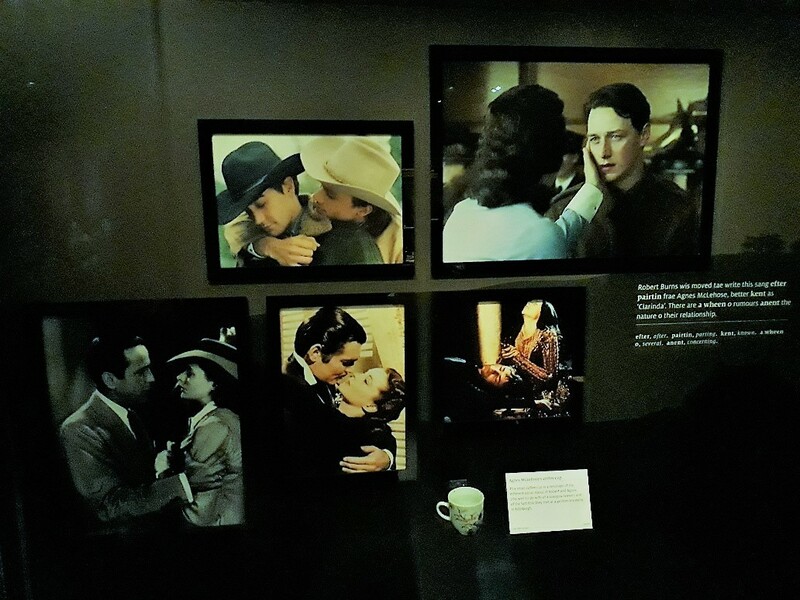 There are five snapshots taken from Hollywood movies that are about unrequited love: Romeo and Juliet, Casa Blanca, Gone with the Wind, Brokeback Mountain and Atonement. This reference to popular culture throughout the 20th and 21st centuries is a great way to convey how love and heart-ache has and always will be a topic of interest and an inspiration for artists no matter their medium. The five iconic unrequited love Hollywood movies. 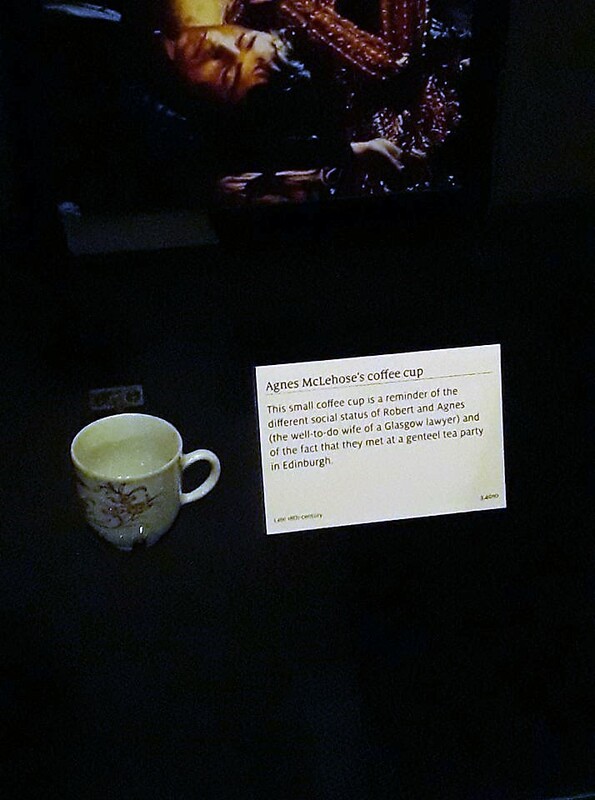 Also, there is a teacup that belonged to Agnes which is used to represent the different social classes of Burns and her; a letter from Burns to Agnes saying he has included a song for publication (i.e. Ae Fond Kiss); another letter from Burns to Agnes in which they use their code names ‘Sylvander’ and ‘Clarinda’ because though separated, Agnes was deeply concerned with propriety and confidentiality; and Ae Fond Kiss shown in the Scots Musical Museum book. Date: 1787, Object No. : 3.6363, Letter from Robert Burns to Agnes McLehose. Date: 1791, Object No. : 3.6373, Letter from Robert Burns to Agnes McLehose. 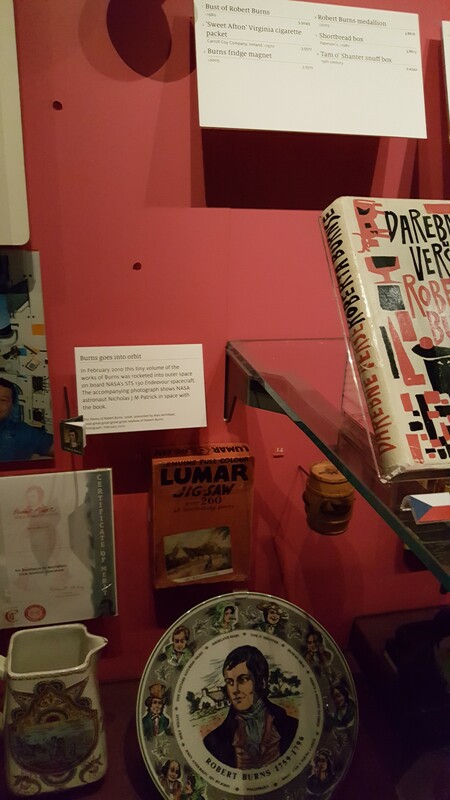 Other objects within the museum’s collection which are worth noting are the silhouette miniature of Agnes, the pair of wine glasses Burns gifted Agnes and a letter from Agnes to Burns. Date: 1788, Object No. : 3.6374. This silhouette is the only known picture of Agnes McLehose. It was produced by Edinburgh artist John Miers. Miers was a skilled artist who could produce very accurate silhouettes. Miers also produced a silhouette of Burns which showed his distinctive nose. This was often used to authenticate other portraits of him. Date: 1792, Object No.:3.6376. 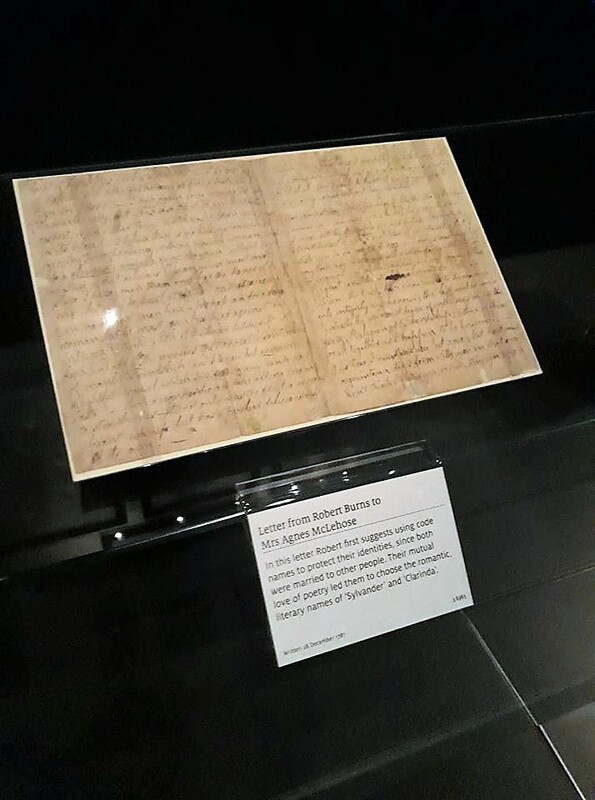 Letter from Agnes McLehose to Robert Burns. 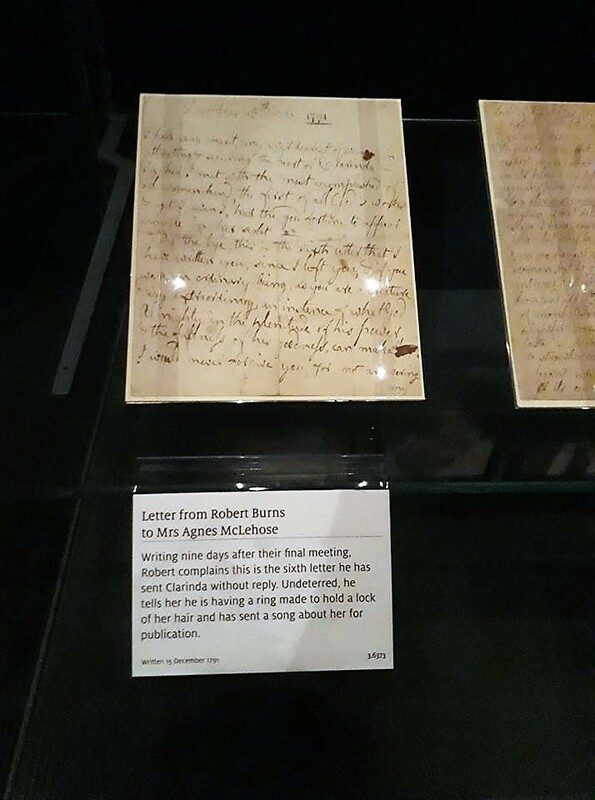 This entry was posted in Exhibition, Object Focus, poetry, Robert Burns, romance, Uncategorized, Writing and tagged Ae Fond Kiss, Agnes McLehose, Exhibition, love, love letters, Object Focus, poetry, Robert Burns, Robert Burns Birthplace Museum, Writing. From the moment of Burns’s death in 1796, a hunger to obtain original versions of his works, letters and personal items began. Naturally, this led to a number of unscrupulous individuals creating forgeries, or passing off unconnected objects as having belonged to the Bard. Few were as prolific or notorious however as one Alexander Howland Smith, known as ‘Antique Smith’, a Scottish document forger of the late C19th whose efforts are now collection items in their own right. Born in 1859, Smith was forging documents in Edinburgh by the 1880s, and began selling his forgeries in 1886. 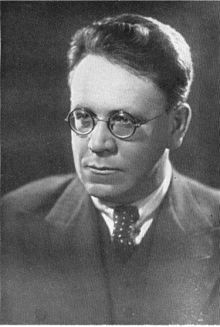 He frequented second hand bookshops, purchasing volumes of old books with blank fly leaves, which he then insisted upon carrying home himself rather than asking for them to be delivered – despite their weight (a practise many bookshop owners found strange!). From these blank fly leaves, Smith forged poems, autographs and historical letters purportedly written by a number of historical figures including Mary Queen of Scots, Walter Scott and Burns himself. He gave his documents an antique appearance by dipping them in weak tea! Things started to go wrong for Smith when manuscript collector James MacKenzie put some of the letters in his ‘Rillbank Collection’ up for auction in 1891, and the auctioneer himself cast doubt on their authenticity by refusing to verify their provenance. A little while later MacKenzie published a letter, supposedly written by Burns, in the Cumnock Express. After a bit of research, one reader discovered that the recipient of this supposed letter, John Hill, had never actually existed, throwing doubt on the entire Rillbank Collection. 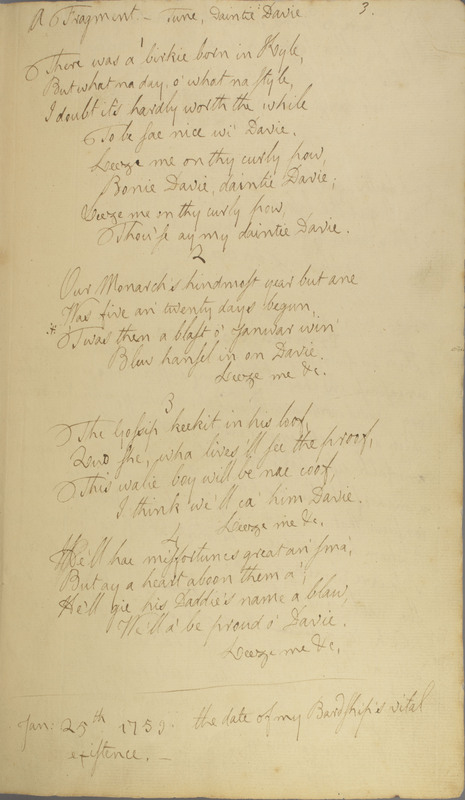 MacKenzie later published two ‘Burns’ poems in the same paper, only to discover that one of them had been written when Burns was only 7 by an entirely different poet! Other forgeries were discovered in the collection of an American, who had purchased letters from Edinburgh manuscript collector James Stillie. By now, word was spreading about the forgeries. In 1892, The Edinburgh Evening Dispatch published an article on the issue, and a reader recognised the handwriting on the facsimiles included as that of Smith, at that time working as chief clerk for a lawyer, Thomas Henry Ferrie. Smith was duly arrested and his trial began on June 26th 1893. Smith was charged with selling forgeries under false pretences. He was found guilty, but the jury recommended leniency and he was sentenced to 12 months. Experts later said that some of his forgeries were not of particularly high quality – often they were dated after the death of their supposed writer, or created using modern paper or writing tools. It is more than possible that many of those who sold his forgeries on would have been fully aware that they were not genuine. It is unknown exactly how many of ‘Antique’ Smith’s forgeries are still around, but we do know that we have some of them in our collection! This entry was posted in Exhibition, Local History, Robert Burns, Writing and tagged 19th century, Alexander Howland Smith, Ayrshire, Documents, edinburgh, Exhibition, Forgery, history, learning, literature, manuscripts, museum, National Trust for Scotland, Object Focus, poetry, Robert Burns, Robert Burns Birthplace Museum, Scotland. Commonplace Books first became significant in early modern Europe as a way of compiling knowledge. ‘Commonplace’ is a translation of the Latin phrase locus communis which means ‘a theme or argument of general application’. This original definition has been expanded to now mean a collection of materials on a certain theme by an individual. Importantly, commonplace books are not diaries or journals, as they are structured thematically rather than chronologically, and do not necessarily relate to the personal lives of their compilers. By the 17th Century, commonplacing was prevalent enough to be formally taught at places such as Oxford University, and there is a strong tradition of literary figures such as John Milton, Mark Twain and Thomas Hardy compiling them. There are two commonplace books belonging to Robert Burns in existence. The first, begun in 1783, was almost certainly not intended for publication, and entries cease in October 1785. The second, begun in Edinburgh in 1787 and sometimes referred to as the Edinburgh Journal, has many interesting entries including early versions of the Bard’s poems and musings on people he knew. On its first page, Burns explains his desire to record his experiences in Edinburgh (where he had just moved), and his observations on the people he has met, while they are still fresh in his mind. He quotes Gray, saying ‘half a word fixed upon… is worth a cart load of recollection’ showing his preference for the written word over memory. Imagine a man of abilities, his breast glowing with honest pride, conscious that men are born equal, still giving that “honor to whom honor is due”; he meets as a Great man’s table a Squire Something, or a Sir Somebody; he knows the noble landlord at heart pays gives the Bard or what- ever he is, a degree o share of his good wishes beyond any at table perhaps, yet how will it mortify him to see a fellow whose abilities would scarcely have made an eight penny Taylor and whose heart is not worth three farthings meet with attention and notice that are forgot to the Son of Genius and Poverty? Burns does confess to being torn, however, because Glencairn was so pleasant to him when they met. Also near the start of the book is a first draft of the song ‘Rantin’ Rovin’ Robin’ referring to the incident in which the gable end of Burns Cottage blew down during a storm in the first few weeks of Robert’s life. Interestingly, in this version, the opening line is ‘There was a birkie born in Kyle,’ as opposed to ‘there was a lad was born in Kyle’. There are then two versions of a poem written in Carse Hermitage on June 1st 1788, with a note beside the first draft instructing the reader to instead read the second draft further into the book. There is also a draft of his more famous poem, On seeing a wounded hare, along with other notes on his works. 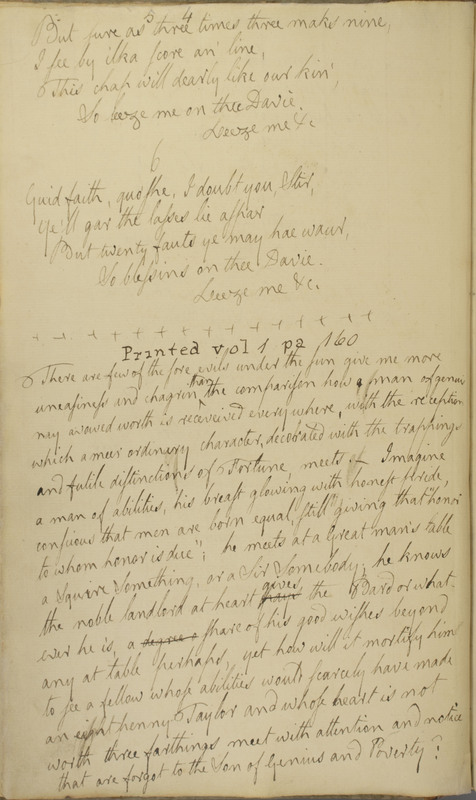 Burns’s second commonplace book is on display in our museum collection and is a fascinating insight into some of the Bard’s personal thoughts, and also on how he drafted his poems. 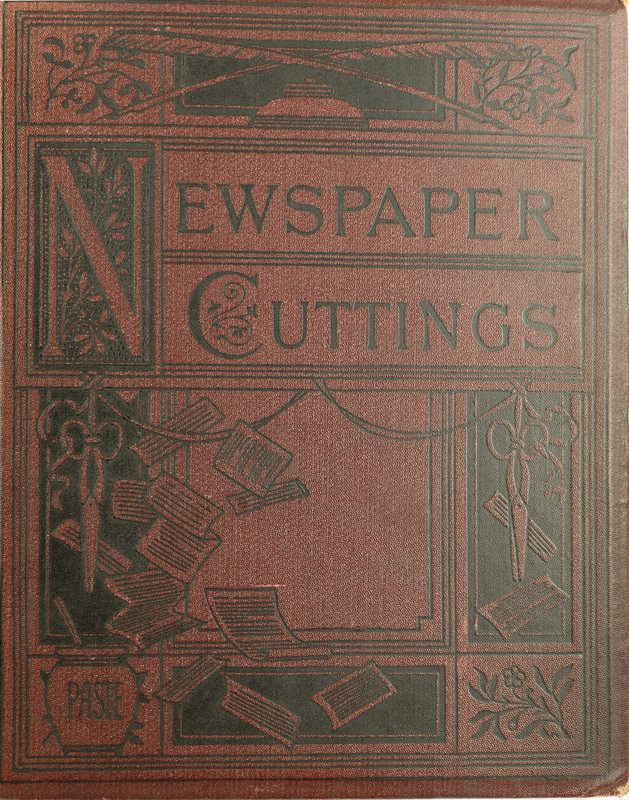 We wonder how many of our readers keep scrapbooks of this kind? This entry was posted in Exhibition, Local History, Object Focus, Robert Burns and tagged 18th century, Ayrshire, Commonplace books, Exhibition, handwriting, history, learning, literature, museum, National Trust for Scotland, Object Focus, Original manuscript, Rantin Rovin Robin, research, Robert Burns, Robert Burns Birthplace Museum. 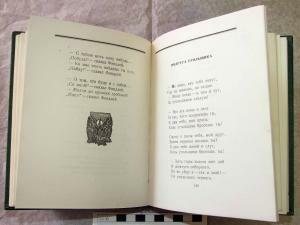 In November 2009, a small book containing 14 Burns poems and songs was presented to astronaut Nick Patrick by ten young Scots taking part in the Scottish Space School. This book was to make a 5.7 million mile journey the following February, completing 217 orbits of the Earth on a two week long mission to the International Space Station. The Scottish Space School is an initiative delivered by the University of Strathclyde, designed to encourage young people to consider careers in science and engineering. These particular students were taking part in a trip to NASA’s Johnson Space Center in Texas, where they were able to hand the book over to Nick Patrick. Originally, the book was given to the Space School by Alan Archibald, a distant relative of Jean Armour, Burns’s wife. It made its out of this world trip to celebrate the Year of Homecoming in 2010 aboard NASA’s STS 130 Endeavour spacecraft. 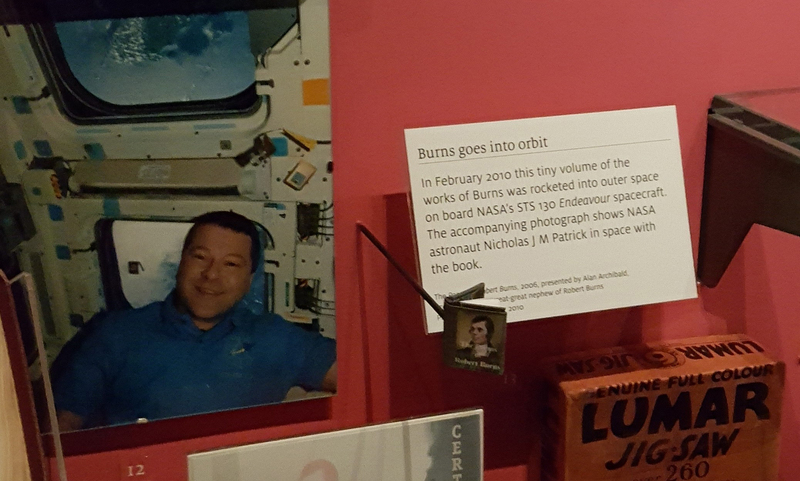 This entry was posted in Object Focus, Robert Burns and tagged 18th century, Alloway, Astronaut, Ayrshire, Exhibition, learning, literature, museum, NASA, National Trust for Scotland, Object Focus, poetry, Robert Burns, Robert Burns Birthplace Museum, Scotland, Space. This blog was written by Iona Fisher, a work experience student from Carrick Academy. In 1788 Burns trained to be an excise officer and was an excise man until he died in 1796, as well as farming in Ellisland. Excise men (also known as gaugers) covered large areas of Scotland’s countryside and their job was to inspect and record taxable materials, such as malted grain, soap, candles and paper, before and after they were manufactured. To do this Burns would use dipping rods to measure liquids and scales to weigh dried materials. Burns was aware that people did not necessarily like excise men, so he carried a pistol around with him to protect himself. With Robert Burns’ health condition getting worse, he moved back to Dumfries to live his last few days. On his deathbed he gave his physician – Dr William Maxwell, his pair of duelling pistols. He died in Dumfries on the 21st of July 1796 from a heart disease. Roberts’s wife, Jean, gave birth to her last child the day of Burns’s funeral and she named him Maxwell after Robert’s physician. 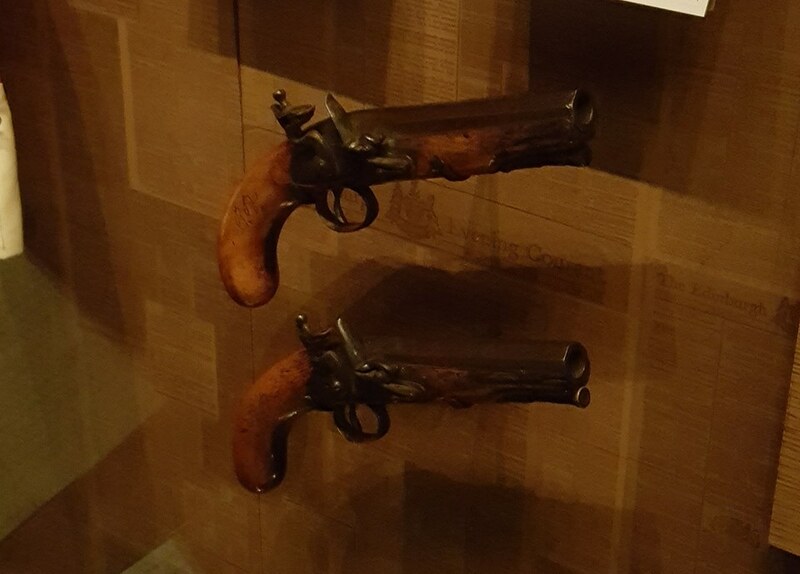 The pistols were donated to the Burns Monument Trust by William Hugh Fleming in 1987 and they are now in the Robert Burns Birthplace Museum. 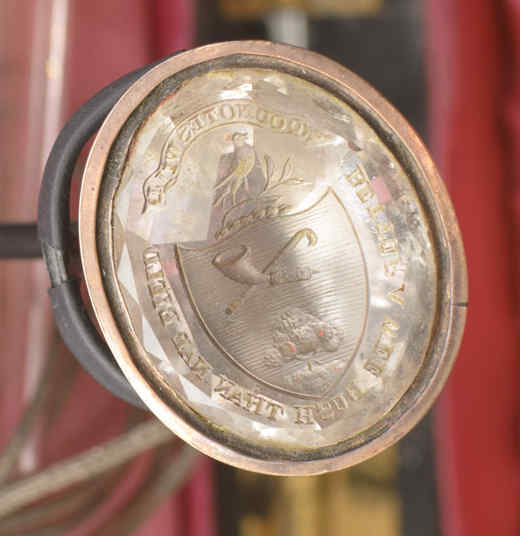 This entry was posted in Exhibition, Object Focus and tagged 18th century, Alloway, Ayrshire, doctor, Exciseman, Exhibition, maxwell, museum, National Trust for Scotland, Object Focus, pistols, Robert Burns, Robert Burns Birthplace Museum, Scotland.